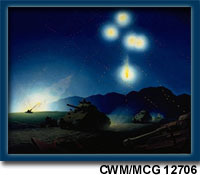 The son of Group of Seven artist Lawren S. Harris, Lawren P. Harris trained in Boston at the Museum School of Fine Arts and was encouraged to become an official war artist by the Canadian High Commissioner to Great Britain, Vincent Massey. The family connection of both to the Massey-Harris agricultural equipment firm was a factor in their initial encounters. Harris served with the Governor General's Horse Guards (3rd Canadian Armoured Reconnaissance Regiment) during the first three years of the Second World War. 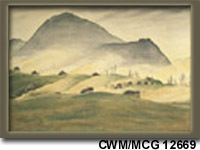 As a war artist he remained with them in Italy as part of the 5th Armoured Division during 1944. 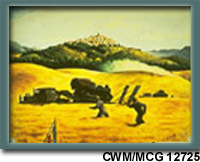 Most of his war landscapes depict tanks in the spectacular hilly landscape near the Melfa and Liri Rivers and towards Ortona. A majority of Harris's paintings are watercolours, a medium he was not, in fact, comfortable with, as he considered himself an oil painter. Many of the watercolours were composed on relatively small sheets of paper. The artist's characteristically careful and detailed application of paint gives them a jewel-like quality, an effect enhanced by the glowing purity of the colours. These small watercolours retain the freshness that was theirs when they were painted and amply discount Harris's perceptions of his worth as a watercolourist. 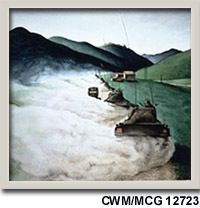 The small watercolour Tank Convoy depicts Sherman tanks of the 2nd Canadian Armoured Regiment (Lord Strathcona's Horse) en route to the railway station at Bovino-Deliceto. The town of Bovino is in the centre background. In Boston and Mustangs near the Melfa, Harris unquestioningly demonstrates his skill as a watercolourist, packing in a wealth of detail and drama into a space less than a foot square.